Technically, my summer break has not begun yet as I still have three days of work in front of me this coming week. Still, it's close enough. I'm declaring the Summer of Tim 2K15 underway! Now before this thing gets too far gone, let me me make two things very clear. 1. I'm not about to pretend that anyone other than me gives a crap about what I do on the day-to-day over the summer. Just like last year, my main purpose here is to document my break from work so at the end of the summer I can look back and realize that I did more than drink beer and watch baseball. 2. Yes, there is currently a "FOR SALE" sign in my front yard -- and, yes, we just moved the summer before last. In fact, that move is what caused documentation of the Summer of Tim 2K13 to end prematurely. But after two years in this house, my wife and I have just never gotten attached to it the way we thought we would. So we're packing up once again. For those few loyal FASTE readers out there, I'm saying upfront that if/when our house sells, v2K15 of the Summer of Tim may potentially suffer the same fate as v2K13. Maybe not, though. With today as Day 1, I've got 66 days away from my job as a high school counselor. That's about 9 1/2 weeks of no alarm clocks, no socks, and no daily bell schedule. Today was supposed to be full of storms but the rain held off just long enough for us to make the drive to nearby Homer, IL where the Annual Homer Soda Festival was scheduled for today. The concept is pretty simple really. With dozens of vendors on hand, you pay 25 cents for a taste of any of the vendors' various soda flavors. While doing our best to ignore the aroma of barbecued meats in the air, the five Lybargers easily tasted our way through ten bucks worth of samples. Our favorites: Reed's Spiced Apple Ginger Brew, Cicero Candied Bacon Cream Soda, Cicero Chocolate Hazelnut, and the Zuberfizz CocoFizz. If you've ever had the desire to drink a Tootsie Roll, CocoFizz is your answer. Honorable mention to one of my childhood favorites: Double Cola. There was an Elvis sighting at the Soda Fest. Sharing a photo with my pal Elvis Hicks, he pretty much nailed it: "Your oldest is humoring you at least. The middle kid is trying. But dude? He ain't havin' it." The kids enjoyed the soda tasting but were really more interested in the massive bubbles that kept floating above our heads. They wanted their hands on some of that action. One dude had two long poles with some rope attached that he dipped in the bubble solution. We weren't quite sure what to expect -- maybe a massive bubble? Nope. Better. Tons of bubbles all at once! The kids lost their minds. The store that had the Elvis statue outside stayed in the back of my mind long enough that I had to check it out. Let me summarize this guy's inventory: Elvis memorabilia, porcelain dolls, and two shelves of random stuff. That was it. 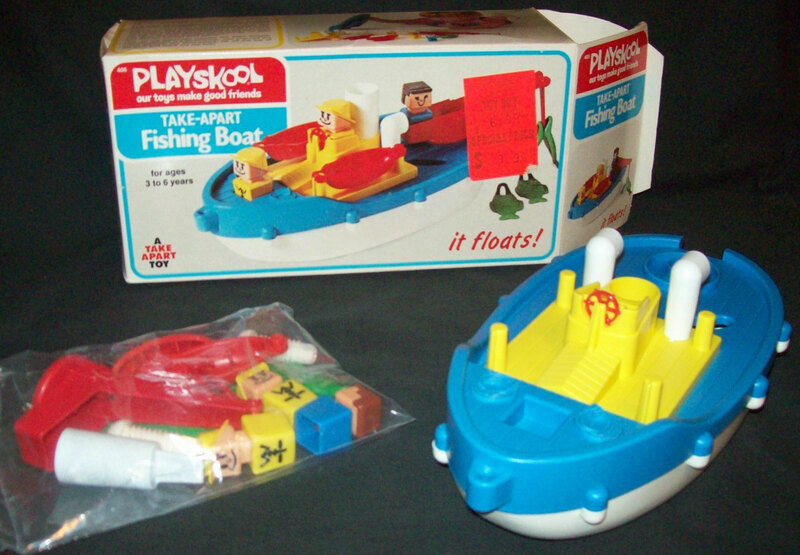 While that may have been all he had, it was enough that he got a buck-fiddy from me for these two guys (from the 1974 Playskool Take-Apart Fishing Boat). We headed home just in time for the rain to hit our windshield as we headed up the highway -- but first we stopped off for lunch with my wife's grandma. She lives just around the corner from a pretty interesting antique/junk store that I hit up now and then. I love looking at stuff in this place but I've hardly ever made a purchase there. I've finally figured out that they just continually move their same old merchandise around their property and rarely seem to bring in much new. Today may have been my last visit to this place for a while -- same old stuff that's way overpriced. They have a never-ending 50% off sale, but still...the glasses seen below, for example, have a sticker price of $18.50 each. Got something pretty cool in the mail today -- a collection of nineteen 35mm slides featuring photographs taken of Fred Rogers at the 1997 Daytime Emmy Awards. Yeah, yeah. Mister Rogers. But I suppose anyone late to the party may not know my story with the Neighborhood. Today was great. A terrific start to another summer break. But let's not pretend there's not bigger news afoot. The Karate Kid is coming to the local drive-in. THE KARATE KID IS COMING TO THE LOCAL DRIVE-IN! My wife will be gone for a few hours tonight after the kids are in bed which is perfect since there's only one way to prepare for Thursday's outdoor screening. I'll be watching The Karate Kid. Who Pooped in the Urinal?